The Meizu MiniOne is probably the second-most expected vapor-ware floating around the ‘Net. We’ve totally neglected it until now because we thought it was impossible to make this work. Or, that if it did work, that it would pass by Apple’s lawyers. This time, it seems to be more than a rumor. I am, of course, truly and utterly unable to decypher the Chinese characters on Meizu’s blog. The guys at Akihabara News could. If you want to see their other products, try here. First of all, there’s the design. There’s no doubt they’ve been influenced by a certain phone that has been delayed for even longer than this one. It’s actually quite confusing. On the outside you get the typical Cupertino color and design features. On the inside and on the display, you get the new Redmond looks. It’s worse than seeing Windows on a Mac’s desktop, really. But at least it offers a little hint. We all know Apple’s interesting pricing scheme: you’ll need a 2-year contract and $600 in order to get the competition’s ringing iPod. It has restricted connectivity and is NOT a smartphone. Radios: triband GSM, WCDMA, WLAN, Bluetooth and a crispy DMB tuner. 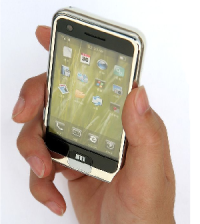 OS: It operates on Windows Mobile 6, making it a fully-fledged smartphone. It looks to be skinned up like Vista and have some interface changes, but these are just renders. The screen: has an amazing resolution of 720×480. They claim it’s able to play movies in full screen. The Cameras: 3 MP on the back, and 0,3 MP on the front for video calls. Optionals: GPS receiver and Video Out. It makes me really happy to see how ambitious these men are. I’m also giggling with glee when thinking what a mighty boot up the arse Apple would receive if the MiniOne’s release really happens. Apple don’t actually offer a smartphone, the price is high, the battery is total crap and the features are pretty limited.. When the radios are off it doesn’t do much more than a normal iPod. If this product really makes it to a prototype stage, it will surely be attacked by Apple in court. Let’s just hope for the best and that maybe we’ll soon see this overdose of (affordable) goodness in our hands too. Will the iPhone be obsolete before its release? The iPhone already is obsolete.. the only cool things it has are the interface, multi-touch screen and…. let’s say the browser, though Symbian’s browser is far better. 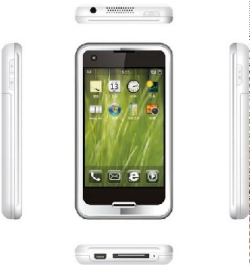 Design-wise, the LG Prada is abot the same, only a bit better. It also sports almost the same options, and it’s been out for quite a while. when & where will be aviable in the USA? You know, the only problem with this is, Apples attorney’s are better. Granted, I think that this iPhone craze is absolutely rediculous in a way that is best described as lies and hype. But, if this is in fact a smart phone, it puts itself in a different genre of phones as the iPhone is multimedia directed, as opposed to multimedia, buisiness, and personal fun. The iPhone will have some strict competetors, I’m just waiting for Microsoft’s Milan. That will be the end of the world. I thought it was Windows CE, not WIndows Mobile. CE is more powerful, and even comes with IE 6. Kevin : true, but Windows Mobile was always easier to implement. And for any smartphone, it’s much much safer and faster to get NetFront for browsing..
alfredo : It always took Meizu longer than what they’ve announced to release their products, but none of them has ever lacked quality. Be sure that we’ll post about the launch here, and give you details on how it can be purchased. My wife bit the bait and is wanting an i phone. I am hoping to convince her that waiting is best since a lot of the technology is still being ‘lied about’ as you say, and prices are coming down astronomically. We tend to bite early then regret that we didnt wait for a cheaper one with more features. Looks like the general consensus is that the Meizu miniOne is worth waiting to see if it is real and look for posts on real tests once it does come out. I see a post about a Microsoft Milan, ill check that out. What do you all think? Any guesses as to when things might be more solid? this is absolutely crazy. it just looks like they took the iphone, changed the color, and made it uglier and crappier. i dont think anyone will buy it and good luck getting past apples attorneys.